At TakeFlight, we LOVE our customers and will do whatever we can to make sure you're 100% satisfied with your purchase. Buy one for yourself, but don't forget to keep these presents in your WISHLIST for gifts. Great for a BIRTHDAY GIFT FOR DAD, CHRISTMAS STOCKING STUFFER, MOTHER'S or FATHER'S DAY, BIRTHDAYS or other special occasions. COOL GADGETS FOR MEN! The men in your life will love this penlight for their EDC gear. Whether you call him dad or pops, grandpa or papa, this manly tool is the perfect gift for the father or grandfather who has everything. ✅ RUGGED & HEAVY DUTY GADGETS || "The Pen is Mightier..." Has Never Rung More True! - Durable and Rugged, Made from CNC Machined AIRCRAFT GRADE ALUMINUM for Superior Strength. 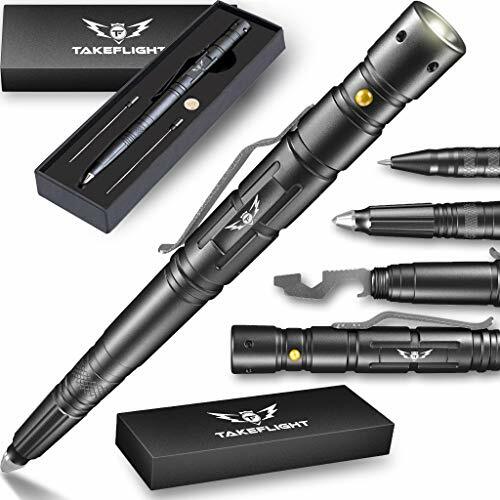 This cool pen multitool has been used by military pilots, Navy SEALs, first responders and other challenging professions and has stood up well to the rigors of daily use. If you've had issues with pens breaking in your pocket or bag and ruining your gear, this is the perfect solution to your problem. ✅ FEEL SAFE WITH THIS SELF DEFENSE TOOL IN YOUR POCKET || Safeguard Against Attackers in Emergency Situations with this Kubotan Style Pen. There are lots of self-defense products on the market, but we don't always remember to carry them with us. Whether you're facing the zombie apocalypse or just trying to get by WTSHTF, this is a great addition to your personal survival gear. ✅ EXCELLENT PERFORMANCE AS AN EVERYDAY USE PEN in Addition to Tactical Features. At 6" x 0.6", Functions and Looks Like Any Other High Quality Pen. Clip to your MOLLE System or Carry in Your Pocket, Briefcase, Laptop Bag, Backpack, Purse, or Bug-out Bag. Perfect for Your Rite in the Rain Book. ✅ DON'T GET TRAPPED || Emergency Glass Breaker Can be Utilized to Crack a Window for Escape. Perfect for Military, Police, Emergency Responders, and Every-day Carry (EDC). ✅ VETERAN-OWNED U.S. BRAND YOU CAN TRUST || 1 Year Unlimited Warranty || 100% Satisfaction Guaranteed. If you're not thrilled, simply contact us via our seller account and we'll replace your item or process a refund. | FREE BONUS! - Extra Replacement Smooth Writing Black Ink Refill. Compatible with Standard Refills. If you have any questions about this product by TakeFlight (TM), contact us by completing and submitting the form below. If you are looking for a specif part number, please include it with your message.